In this section, we will cover D3.js Scales so that instead of resizing our SVG Coordinate space to our data, we can resize our data to fit into our pre-defined SVG Coordinate Space. Which was great - we scaled our SVG Coordinate Space up to include the data. However, what if our data attributes suddenly quadrupled. And then, quadrupled again. And then....etc. As the data attributes grow, our SVG Coordinate Space will grow as well. This is a problem once the SVG Viewport/Coordinate Space is bigger than the browser window. At some point, the size is too big to scroll through and it becomes incredibly easy to get lost. The purple rectangle would be so far to the right that it would be practically impossible to see. The red rectangle would be so far down that it would be practically impossible to see as well. 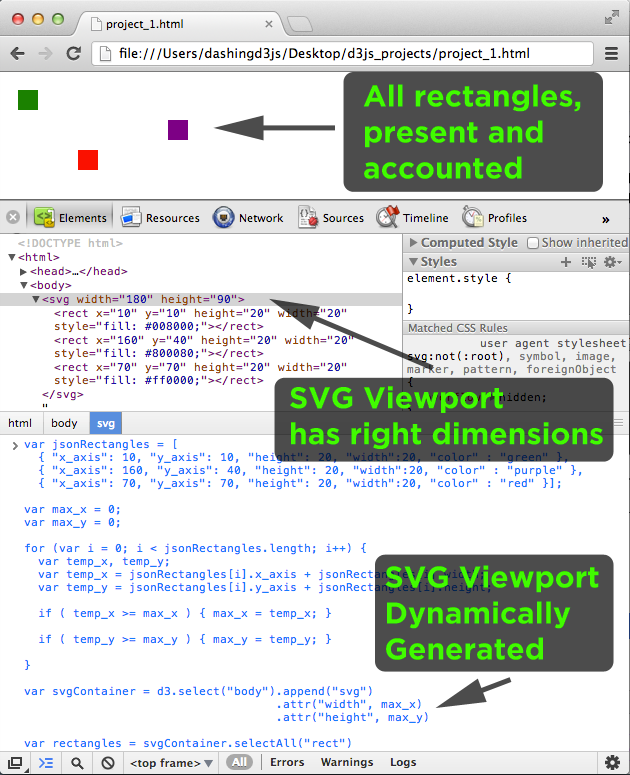 In order to keep our SVG Viewport within the browser window, we can scale our data to fit into the space allotted. Which is where D3.js Scales come in. D3.js provides functions to perform data transformations. These functions map an input domain to an output range. Said another way, these functions take an interval and transform it into a new interval. Because the D3.js Scales are functions, not only can we map one input domain to an output range, the functions can convert a number in the domain to an output in the range. Let us say that our input data will be some number between (and including) 0 and 10,000. We want to transform this into an interval of numbers between (and including) 0 and 100. We take an interval (called Domain by D3.js) and transform it into a new interval (called Range by D3.js). One possible reason for doing this is that we might have an SVG Viewport whose width is 100, so we need to scale our data down to fit into the window. It is painful to divide by 100 and then type out the new answer every time. Which is all well and good, except for one thing: lots of manual work. 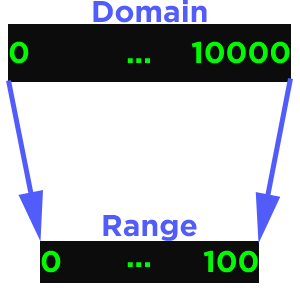 What we would rather do is tell the computer that the initial interval (domain) is 0 to 10,000 and that the new interval (range) should be 0 to 100. Then when a data point comes in, we want the computer to automatically convert it for us. This constructs a new linear scale with the default domain [0,1] to range [0,1] which produces a mapping of 1:1. We can override the default domain by specifying the domain using chained syntax. As we did not change the range, we are mapping the domain of 0 to 10000 onto 0 to 1. We can override the default range by specifying the range using chained syntax. Bingo! Much less manual work! We were able to bypass the step of figuring out how to map our initial interval (domain) onto our new interval (range). We already knew that the max possible value of the data was 10,000. This allowed us to enter the domain as [0,10000]. What if we didn't know what the max value of our data was going to be? D3.js has a function (D3.max) which calculates the maximum value of an array. Now, regardless of how big the biggest data point ends up being, we know that the max value will help us with the domain mapping. We already knew that the min possible value of the data was 0. What if we didn't know what the min value of our data was going to be? D3.js has a function (D3.min) which calculates the minimum value of an array. Now, regardless of how small the smallest data point ends up being, we know that the min value will help us with the domain mapping. D3.js comes with Quantitative Scales (one of which we've already covered - Linear) and Ordinal Scales. Ordinal: for non quantitative scales, like names, categories, etc. We will stick with the Linear Scale for a while as we cover the next few sections. Using the D3.js Linear Scales, we will now be able to resize our data to fit into our pre-defined SVG Coordinate Space, rather than resizing our SVG Coordinate space to fit our data.